The coat of arms of the Tajik Autonomous Soviet Socialist Republic circa 1929. "Tajik Autonomous Soviet Socialist Republic" is written (from top to bottom) in Tajik Latin, Tajik Arabic, and Russian Cyrillic. The Tajik language has been written in three alphabets over the course of its history: an adaptation of the Perso-Arabic script (specifically the Persian alphabet), an adaptation of the Latin script, and an adaptation of the Cyrillic script. Any script used specifically for Tajik may be referred to as the Tajik alphabet, which is written as алифбои тоҷикӣ in Cyrillic characters, الفبای تاجیکی‎ with Arabic script, and alifboji toçikī in Latin script. The use of a specific alphabet generally corresponds with stages in history, with Arabic being used first, followed by Latin for a short period and then Cyrillic, which remains the most widely used alphabet in Tajikistan. The Bukhori dialect spoken by Bukharan Jews traditionally used the Hebrew alphabet but more often today is written using the Cyrillic variant. As with many post-Soviet states, the change in writing system and the debates surrounding it is closely intertwined with political themes. Although not having been used since the adoption of Cyrillic, the Latin script is supported by those who wish to bring the country closer to Uzbekistan, which has adopted the Latin-based Uzbek alphabet. The Persian alphabet is supported by the devoutly religious, Islamists, and by those who wish to bring the country closer to Iran and their Persian heritage. As the de facto standard, the Cyrillic alphabet is generally supported by those who wish to maintain the status quo, and not distance the country from Russia. As a result of the influence of Islam in the region, Tajik was written in the Persian alphabet up to the 1920s. Until this time, the language was not thought of as separate and simply considered a dialect of the Persian language. [need quotation to verify] The Soviets began by simplifying the Persian alphabet in 1923, before moving to a Latin-based system in 1927. The Latin script was introduced by the Soviet Union as part of an effort to increase literacy and distance the, at that time, largely illiterate population, from the Islamic Central Asia. There were also practical considerations. The regular Persian alphabet, being an abjad, does not provide sufficient letters for representing the vowel system of Tajik. In addition, the abjad is more difficult to learn, each letter having different forms depending on the position in the word. The Decree on Romanisation made this law in April, 1928. The Latin variant for Tajik was based on the work by Turcophone scholars who aimed to produce a unified Turkic alphabet, despite Tajik not being a Turkic language. The literacy campaign was successful, with near-universal literacy being achieved by the 1950s. As part of the "russification" of Central Asia, the Cyrillic script was introduced in the late 1930s. The alphabet remained Cyrillic until the end of the 1980s with the disintegration of the Soviet Union. In 1989, with the growth in Tajik nationalism, a law was enacted declaring Tajik the state language. In addition, the law officially equated Tajik with Persian, placing the word Fârsi (the local name for Persian) after Tajik. The law also called for a gradual reintroduction of the Persian (Arabic) alphabet. The Persian alphabet was introduced into education and public life, although the banning of the Islamic Renaissance Party in 1993 slowed down the adoption. In 1999, the word Fârsi was removed from the state-language law. As of 2004[update] the de facto standard in use is a Cyrillic alphabet, and as of 1996[update] only a very small part of the population can read the Persian alphabet. The letters of the major versions of the Tajik alphabet are presented below, along with their phonetic values. There is also a comparative table below. A variant of the Persian alphabet (technically an abjad) is used to write Tajik. In the Tajik version, as with all other versions of the Arabic script, with the exception of ا‎ (alef), vowels are not given unique letters, but rather optionally indicated with diacritic marks. The front page of Kommunisti Isfara from 15 May 1936. The unusual character Ƣ is called Gha and represents the phoneme /ɣ/. The character is found in the Common Turkic Alphabet in which most non-Slavic languages of the Soviet Union were written until the late 1930s. The Latin alphabet is not used today, although its adoption is advocated by certain groups. The Cyrillic script was introduced in Tajik Soviet Socialist Republic in the late 1930s, replacing the Latin script that had been used since the October Revolution. After 1939, materials published in Persian in the Persian alphabet were banned from the country. The alphabet below was supplemented by the letters Щ and Ы in 1952. Text detail from the reverse of the 1 ruble note. The ruble was replaced in 2000 as a result of increasing inflation. In addition to these thirty-five letters, the letters ц, щ, and ы can be found in loanwords, although they were officially dropped in the 1998 reform, along with the letter ь. Along with the deprecation of these letters, the 1998 reform also changed the order of the alphabet, which now has the characters with diacritics following their unaltered partners, e.g. г, ғ and к, қ etc. leading to the present order: а б в г ғ д е ё ж з и ӣ й к қ л м н о п р с т у ӯ ф х ҳ ч ҷ ш ъ э ю я. In 2010 it was suggested that the letters е ё ю я might be dropped as well. The letters е and э have the same function, except that э is used at the beginning of a word (ex. Эрон, "Iran"). During the period when the Cyrillicization took place, Ӷ ӷ also appeared a few times in the table of the Tajik Cyrillic alphabet. ISO 9 — The International Organization for Standardization ISO 9 specification. KNAB — From the placenames database of the Institute of the Estonian Language. ALA-LC — The standard of the Library of Congress and the American Library Association. BGN/PCGN — The standard of the United States Board on Geographic Names and the Permanent Committee on Geographical Names for British Official Use. The Hebrew alphabet is, like the Persian alphabet, an abjad. It is used for the Jewish Bukhori dialect primarily in Samarkand and Bukhara. Additionally, since 1940, when Jewish schools were closed in Central Asia, the use of the Hebrew Alphabet outside Hebrew liturgy fell into disuse and Bukharian Jewish publications such as books and newspapers began to appear using the Tajik Cyrillic Alphabet. Today, many older Bukharian Jews who speak Bukharian and went to Tajik or Russian schools in Central Asia only know the Tajik Cyrillic Alphabet when reading and writing Bukharian and Tajik. Sample text: דר מוקאבילי זולם איתיפאק נמאייד. מראם נאםה פרוגרמי פירקהי יאש בוכארייאן.‎ – Дар муқобили зулм иттифоқ намоед. Муромнома – пруграми фирқаи ёш бухориён. Тамоми одамон озод ба дунё меоянд ва аз лиҳози манзилату ҳуқуқ бо ҳам баробаранд. Ҳама соҳиби ақлу виҷдонанд, бояд нисбат ба якдигар бародарвор муносабат намоянд. Tamomi odamon ozod ba dunjo meojand va az lihozi manzilatu huquq bo ham barobarand. Hama sohibi aqlu viçdonand, bojad nisbat ba jakdigar barodarvor munosabat namojand. تمام آدمان آزاد به دنیا می‌آیند و از لحاظ منزلت و حقوق با هم برابرند. همه صاحب عقل و وجدانند، باید نسبت به یکدیگر برادروار مناسبت نمایند.‎ תמאם אדמאן אזאד בה דניא מיאינד ואז לחאז מנזלת וחקוק בא הם בראברנד. המה צאחב עקל וג׳דאננד، באיד נסבת בה יכדיגר בראדרואר מנאסבת נמאינד. All human beings are born free and equal in dignity and rights. They are endowed with reason and conscience and should act towards one another in a spirit of brotherhood. Tamomi odamon ozod ba dunë meoând va az liḩozi manzilatu ḩuķuķ bo ḩam barobarand. Ḩama soḩibi aķlu viçdonand, boâd nisbat ba âkdigar barodarvor munosabat namoând. Vowel-pointed Persian includes the vowels that are not usually written. Баниодам аъзои як пайкаранд, ки дар офариниш зи як гавҳаранд. Чу узве ба дард оварад рӯзгор, дигар узвҳоро намонад қарор. Саъдӣ بَنی‌آدَم اَعضایِ یَک پَیکَرَند، که دَر آفَرینِش زِ یَک گَوهَرَند. چو عُضوی به دَرد آوَرَد روزگار، دِگَر عُضوها را نَمانَد قَرار.‎ سعدی‎ بنی‌آدم اعضای یک پیکرند، که در آفرینش ز یک گوهرند. چو عضوی به درد آورد روزگار، دگر عضوها را نماند قرار.‎ سعدی‎ בַּנִי־אָדַם אַעְזָאי יַךּ פַּיְכַּרַנְד, כִּה דַר אָפַרִינְשׁ זִ יַךּ גַוְהַרַנְד. צ׳וּ עֻזְוֵי בַּה דַרְד אָוַרַד רוֹזְגָאר דִגַּר עֻזְוְהָא רָא נַמָאיַנְד קַרָאר סַעְדִי. בני־אדם אעזאי יך פיכרנד, כה דר אפרינש ז יך גוהרנד. צ׳ו עזוי בה דרד אורד רוזגאר דגר עזוהא רא נמאינד קראר סעדי. Advertisement in Cyrillic for the admission of the graduate students by the research institutes of the Tajik Academy of Sciences. 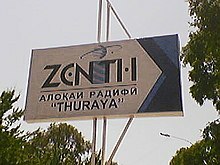 A biscriptal sign incorporating an English word, "Zenith", written in the Latin script, and Tajik written in Cyrillic. 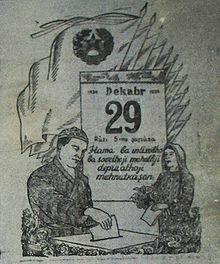 An illustration from Kommunisti Isfara, a newspaper published in Isfara in northern Tajikistan, inviting citizens to vote in an election on 29 December 1939. The word for "December", Dekabr is clearly visible. A table comparing the different writing systems used for the Tajik alphabet. The Latin here is based on the 1929 standard, the Cyrillic on the revised 1998 standard, and Persian letters are given in their stand-alone forms. ^ Khudonazar, A. (2004) "The Other" in Berkeley Program in Soviet and Post-Soviet Studies, 1 November 2004. ^ ed. Hämmerle 2008, p. 76. ^ Cavendish 2006, p. 656. ^ Landau & Kellner-Heinkele 2001, p. 125. ^ ed. Buyers 2003, p. 132. ^ ed. Ehteshami 2002, p. 219. ^ ed. Malik 1996, p. 274. ^ Banuazizi & Weiner 1994, p. 33. ^ Westerlund & Svanberg 1999, p. 186. ^ ed. Gillespie & Henry 1995, p. 172. ^ Badan 2001, p. 137. ^ Winrow 1995, p. 47. ^ Parsons 1993, p. 8. ^ RFE/RL, inc, RFE/RL Research Institute 1990, p. 22. ^ Middle East Institute (Washington, D.C.) 1990, p. 10. ^ Ochsenwald & Fisher 2010, p. 416. ^ Gall 2009, p. 785. ^ Gitelman, Zvi Y (2001). A Century of Ambivalence: The Jews of Russia and the Soviet Union, 1881 to the Present. Indiana University Press. p. 203. ISBN 9780253214188. ^ Изд-во Академии наук СССР (1975). "Вопросы языкознания". Вопросы языкознания: 39. Badan, Phool (2001). Dynamics of Political Development in Central Asia. Lancers' Books. Retrieved 17 November 2012. Banuazizi, Ali; Weiner, Myron, eds. (1994). The New Geopolitics of Central Asia and Its Borderlands. Indiana University Press. ISBN 0253209188. Retrieved 17 November 2012. Borjian, Habib (27 July 2005). "TAJIKISTAN v. DICTIONARIES AND ENCYCLOPEDIAS". Encyclopædia Iranica. Encyclopædia Iranica. Retrieved 17 November 2012. Buyers, Lydia M. (2003). Central Asia in Focus: Political and Economic Issues (illustrated ed.). Nova Publishers. ISBN 1590331532. Retrieved 17 November 2012. Cavendish, Marshall (2006). World and Its Peoples. Marshall Cavendish. ISBN 0761475710. Retrieved 17 November 2012. Ehteshami, Anoushiravan, ed. (2002). From The Gulf To Central Asia: Players In The New Great Game. Arabic & Islamic Studies. University of Exeter Press. ISBN 0859894517. Retrieved 17 November 2012. Gall, Timothy L. (2009). Gall, Timothy L.; Hobby, Jeneen (eds.). Worldmark encyclopedia of cultures and daily life. Volume 4 of Worldmark Encyclopedia of Cultures and Daily Life: Asia and Oceania (2, revised ed.). Gale. ISBN 1414448929. Retrieved 17 November 2012. Gillespie, Kate; Henry, Clement M., eds. (1995). Oil in the New World Order (illustrated ed.). University Press of Florida. ISBN 0813013674. Retrieved 17 November 2012. Hämmerle, Christa, ed. (2008). Gender Politics in Central Asia: Historical Perspectives and Current Living Conditions of Women. Volume 18 of L'Homme Schriften. Reihe zur Feministischen Geschichtswissenschaft. Böhlau Verlag Köln Weimar. ISBN 3412201405. Retrieved 17 November 2012. Landau, Jacob M.; Kellner-Heinkele, Barbara, eds. (2001). Politics of Language in the Ex-Soviet Muslim States: Azerbayjan, Uzbekistan, Kazakhstan, Kyrgyzstan, Turkmenistan, and Tajikistan (illustrated ed.). St. Martin's Press. ISBN 0472112260. Retrieved 17 November 2012. Malik, Hafeez, ed. (1996). Central Asia: Its Strategic Importance and Future Prospects (reprint ed.). St. Martin's Press. ISBN 0312164521. Retrieved 17 November 2012. Ochsenwald, William; Fisher, Sydney Nettleton (2010). The Middle East: A History (7, illustrated ed.). McGraw-Hill Education. ISBN 007338562X. Retrieved 17 November 2012. Parsons, Anthony (1993). Central Asia, the last decolonization. David Davies Memorial Institute. Retrieved 17 November 2012. Siddikzoda, Sukhail (August 2002). "TAJIK LANGUAGE: FARSI OR NOT FARSI?" (PDF). Media Insight Central Asia. CIMERA (# 27): 1–3. Archived from the original (PDF) on 13 June 2006. Retrieved 14 June 2014. Westerlund, David; Svanberg, Ingvar, eds. (1999). Islam Outside the Arab World. St. Martin's Press. ISBN 0312226918. Retrieved 17 November 2012. Winrow, Gareth M.; Former Soviet South Project, Russian and CIS Programme (Royal Institute of International Affairs) (1995). Turkey in post-Soviet Central Asia. Royal Institute of International Affairs. ISBN 0905031997. Retrieved 17 November 2012. Wikimedia Commons has media related to Tajik alphabet.